The last game to finish was between Ding Liren and Kramnik. The Russian star played well throughout the game and managed to cause his opponent some problems but Ding made no mistakes and the game never really crossed the boundaries of draw. The match of the other leading team, Odlar Yurdu went very well for the Azeris. The score could be even higher for them if Abasov could beat Rodshtein in a winning albeit difficult final. Both Mirzoev and Mamedov ran into difficulties in the opening but when their opponents made inaccuracies they took full advantage of them and equalized. In the games Naiditsch-Svidler and Guseinov-Fedoseev however the Azeris had the advantage and although Peter Svidler held, out-of-form Fedoseev played terribly and lost. Thus the match ended 3,5-2,5 for Odlar Yurdu, “Land of Fire” as Azerbaijan is called and takes its name from. Legacy Square Capital won with the same score against Beer Sheva Chess Club thanks to sole win of Zvjaginsev over Mikhalevski. The Russians are now at 9 points and sharing third place with Alkaloid, Csm Baia Mare and AVE Novy Bor. The latter two, Romanian and Czech clubs, played a very interesting match today which saw four decisive games but no winner. But the most instructive game was the nice draw Lupulescu-Navara which showed that Czech star knows his fortresses! 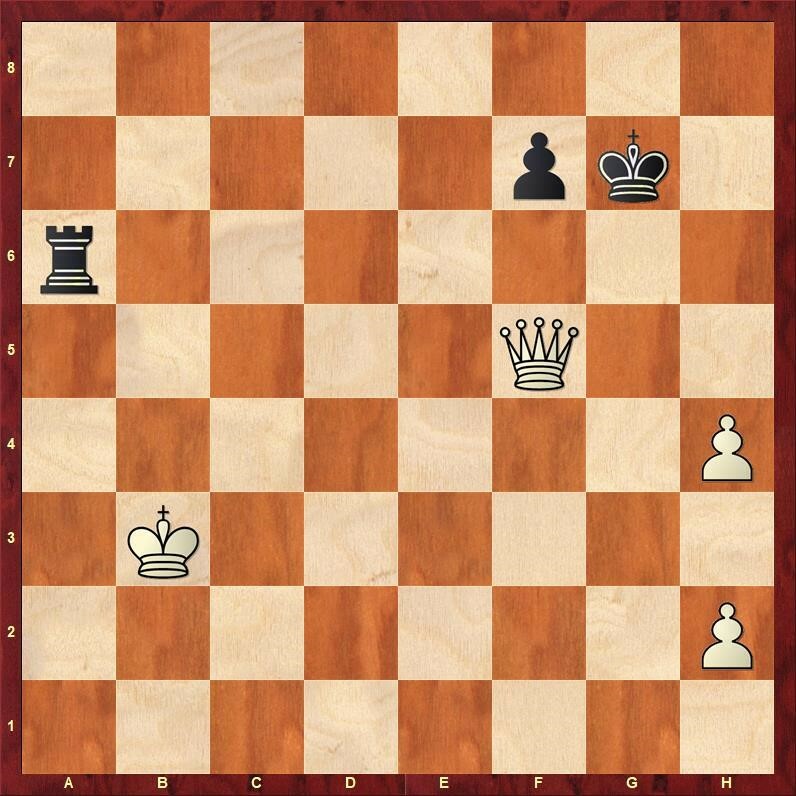 This is without the extra h2 pawn the same ending that was studied by Grigoriev, given in Dvoretsky’s “Endgame Manual” as well. As Dvoretsky points out, black should be careful about not letting the queen to f8 and also not allow h6 and if he takes care of those things this position is a fortress. Rook is swinging between e6 and h6. Navara knew this particular fortress and made no mistakes so Lupulescu had to concede the half point in the end. If the game was winning before this position or not, remains an open question but probably white could play somewhat subtler. The women section saw not many surprises. Batumi Chess Club Nona won against Legacy Square Capital 3-1, thanks to wins by Dzagnidze and Batsiashvili and now they are sole leaders with 10 points. 1 point behind is Odlar Yurdu who tied with UGRA Chess Club today, a nice result for which they should be thankful to Baira Kovanova who spoiled a better position by blundering a mate in time trouble and had to give up her bishop to avoid leading to a loss. A real tragedy for UGRA Chess Club, now they are at 8 points and have no chance to win the tournament. Early leaders Bossa Nova beat today Turkish club Anatolia 3-1 despite a nice win over FM Stetsko by WFM Arda who is the best performing Turkish player in this tournament. Studentesc Medicina Timisoara was also paired against another local team, Aegean and they were more merciless: 4-0. Tomorrow the Romanian team will play Batumi Chess Club and try to spoil their tournament with a surprise.